This is the second installment of Cheryls five part New Zealand expedition. To see the first, go here. From our high vantage point, an eerie light glinted off the flinty grey Southern Ocean far below. Regular hearty gusts staggered us and whipped shredded clouds over our heads, as if blown 1200 open-water miles straight from Antarctica and quite pissed off about it. Limestone tors, black and lichen-speckled earth-bones, loomed over the choppy water of the several tarns scattered around us on the ridge. We were enraptured. 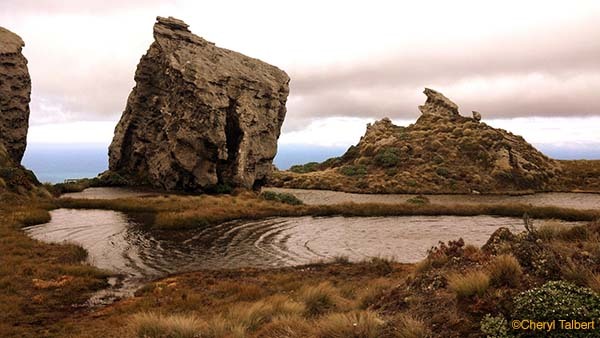 This was the crux of the Hump Ridge, a southernmost promontory of the 450-mile-long Southern Alps of New Zealand in Fiordland National Park, and the goal of the first trekking day of a month-long, multi-trek itinerary that would stretch from the upper end of the North Island to the far south of the South Island. The two of us, friends from the Mountaineers and veterans of innumerable long and short backpacks across the Northwest, were due to meet up with a larger group from the club in a few days in Queenstown. 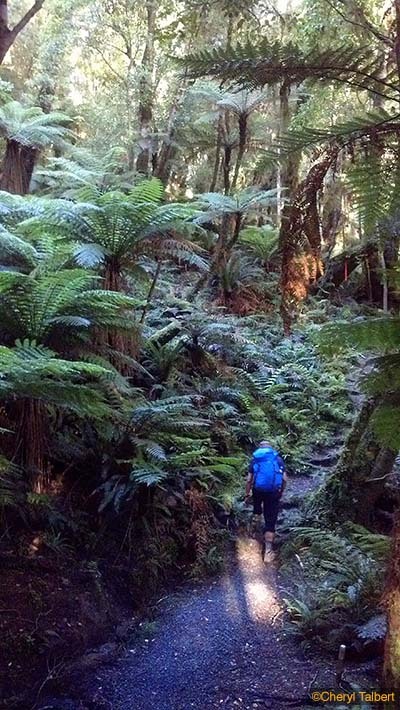 First we were going to check out the Hump Ridge track, highly recommended by buddies who had done it the prior year. Though the track is easily accessed by a daily bus from Te Anau 1.5 hours north, or by bus or car from the Invercargill airport 1 hour east, we had chosen a three-day scenic route, flying into Christchurch and driving in a rental car south along the east coast of the South Island, through Dunedin onto the Otago Peninsula to see yellow-eyed penguins and Royal Albatross, and then across the golden Otago plains on the southern end of the Island to the tiny town of Tuatapere where the track office is housed. 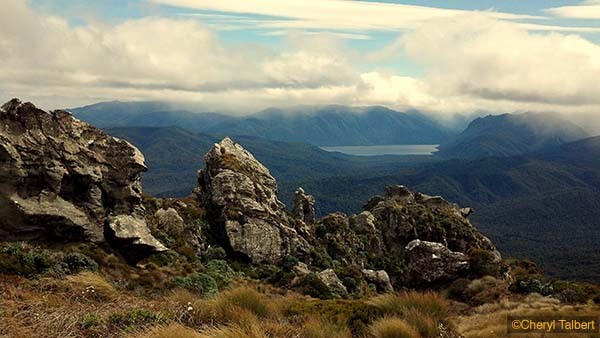 The Hump Ridge Track is run by a community corporation, a unique partnership between a nearby community, the NZ Department of Conservation and the local Maori population, and the only privately operated walking track on government land in New Zealand. Languishing with the decline of the local timber industry and rerouting of a rail line, the residents of the town of Tuatapere proposed in 1988 to reinvigorate their fortunes by building a 26.5 mile hiking track that sampled the seacoast, native woodland, historic timber viaducts and expansive alpine views in their nearby corner of Fiordland National Park. A charitable trust was formed and raised over three million dollars to build the track and facilities, finally opened in November 2001 after more than 25,000 hours of sweat equity by local volunteers. The track starts about 20 minutes southwest of Tuatapere, in silver beech scrub right on the Southern Ocean at Te Wae Wae bay. Entering almost immediately into the Park, we found ourselves in a wonderland of gnarled and lichen-encrusted beech trees, massive Rimu trunks and towering tree ferns, all clothed thickly in moss reminiscent of the deepest Northwest rainforest. Along this section we took particular note of odd rectangular wooden boxes on the forest floor, obviously traps of some kind with an egg perched inside near each end, and each box labeled with the name of a sponsor (“Ladies Club of Tuatapere” read one, “Invercargill Youth Soccer” read another). This was a front in the nationwide fierce battle of New Zealanders against the stoat, a small and highly fecund weasel-like creature that had been imported to control rabbits but instead was now decimating the country’s increasingly rare songbird and flightless bird populations by chowing on their eggs. Score cards were hung on the hut walls entitled “Predators Destroyed” and marked proudly each day with kill counts. No squeamishness or half-measures here – this was life and death, native birds vs. nasty imported pest. The trail repeatedly climbed and descended several coastal bluffs and crossed several long narrow suspension bridges before dumping us out to traverse the two mile long crescent of Blowholes Beach, replete with haystack rocks and hazy outlines of Stewart Island to the southeast. Then it was up, and up, and UP…nearly 3000 feet of gain, through ever more weather-twisted tree trunks, sometimes hand-over-hand on steep sections of interwoven roots, to gain the treeline. 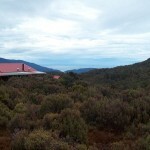 Suddenly, through the trees, Views with a capital V – the panorama of the Southern ocean, the tors bristling on the ridge above, Okaka Lodge tucked into a fold near the ridgetop. A marvel of hand-built boardwalk – nearly 7 miles of it, meticulously covered with chicken wire for traction – threaded across our field of view to the ridge. The boardwalk-loop among the tors and tarns through the sub-alpine tussock grass and flowers on the ridgetop was a highlight reel – Fiordland peaks and lakes one way, wide sweep of beach and ocean the other way, the verdant hills of the Hump Ridge rolling its way south and down in between, clouds reflecting in the many small tarns, and the tors with the distinct feel of Stonehenge scattered all around. A short way back down the ridge was Okaka hut, its comfy living-dining area featuring soft sofas and tables affording a broad view east across the bay. We got two of their tidy 8-bunk rooms to ourselves this night. Though well equipped with gas burners for trekkers to prepare their own hot food and drink, unlike most NZ backcountry huts the Hump Ridge huts have a goodie-cabinet with food and libations available for purchase, and they cook up a hearty pot of porridge with brown sugar for guests for breakfast. Day 2 started with a descent through stunted silver beech and flame-red rata, the miles of boardwalk tracing the way back up to the tors in the fog and ahead to the coastline far below. As we dropped below the ridge, the shaggy beech, huge flute-barked totara and towering rimu trees became a fairy forest glowing with shafts of sunlight. 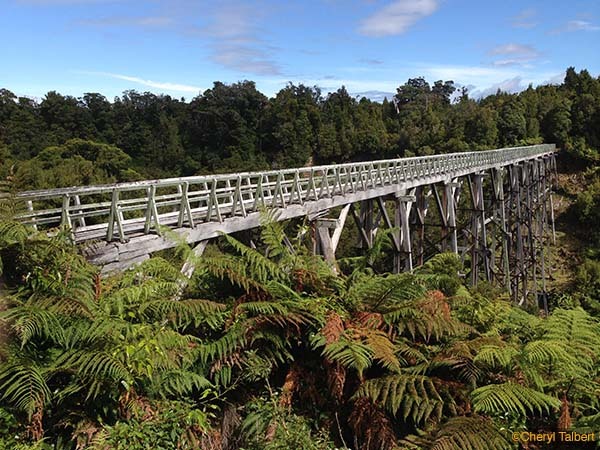 Finally, after hundreds of wooden chicken-wired steps, the track reached sea-level, passing through private Maori land on the track of an old railway, and leading over three high wooden trestles – ‘viaducts’ – originally built to haul timber to a short-lived port on the bay. The longest, the 410-foot-long, 120-foot-high Percy Burn viaduct, is reputedly the largest one still surviving on the planet. The sun had warmed the day considerably by early afternoon when we reached Port Craig Lodge, again securing two 8-bed dorm rooms all to ourselves and checking out the sunny spacious common room/dining area and kitchen. The lodge has an expansive cliff-top view south to the Southern Ocean from just outside its backdoor, and 5 minutes’ walk from the Lodge is a sheltered cove littered with the remains of the old sawmill and port complex. Within minutes of us wading into the waves, the local pod of three curious Hectors dolphins – the smallest dolphins in the world, and quite rare – swam up within six feet of us, and a fur seal emerged to bask on the breakwater. And unbeknownst to us at the time, a rest on the warm sand proved a nasty introduction to the infamous biting sandfly which left welts that still itched a week later. Alas, the price of paradise. On day 3, after another welcome bowl of hot porridge we wound our way the final 10.5 miles back along the forested cliff top, up and down over the bluffs under the tree fern canopy, and back across the expanse of Blowholes beach to the trailhead, making it to the car by noon. By this time the chill and damp of the ridgetop fog and wind had been totally driven from our bones by a nearly tropical sun. Near the end of the track, a kea – New Zealand’s intelligent and inquisitive alpine parrot – flew over to check us out, the iridescent green and orange underside of its wings flashing as it passed….”KEE-ahhh, KEE-ahhh!” “ Welcome to New Zealand – we’ll be seeing YOU on another ridgetop very soon!” YES! Advance bookings are required. Go to online, where it’s easy to book track tickets and transport from Tuatapere to Rarakau. Track packages start at $NZ175, with extras available including track transport to and from Tuatapere hot showers, hot stone massages (at Port Craig), and helicopter transport for your person and/or your gear. Stay at the cozy Waiau Hotel in Tuatapere, with included hot breakfast, fun crowds and great Blue Cod fish and chips in the adjoining bar/restaurant. NZ Part 1 – Why New Zealand? 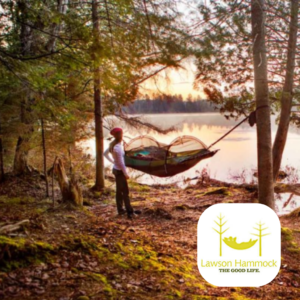 I am a newly-retired fifty-something who spent a career as a forester, growing trees and tree seedlings. I was drawn to the Northwest in 1977 by the magnificent forests (which supported me and my husband raising two kids and several adored dogs in this amazing place); since then I’ve had an insatiable passion for hiking and backpacking in the high Cascades, much of it with the Mountaineers – the steeper the route, the broader the vista, the better! In the last decade I’ve also discovered a passion for international travel, and now I’m combining these passions in the form of treks on the spines of the world.